Yeldon visited the Bills on Tuesday, Adam Schefter of ESPN reports. Analysis: With Chris Ivory no longer in the mix, the Bills' running back depth chart is currently headed by incumbent starter LeSean McCoy and veteran Frank Gore. If Yeldon ends up with Buffalo, he'd add valuable depth and a viable pass-catching alternative out of the team's backfield. Yeldon visited with the Patriots on Wednesday, Field Yates of ESPN reports. 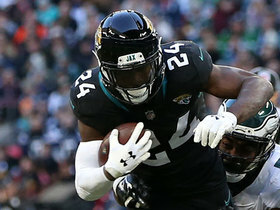 Analysis: Yeldon displayed versatility in four seasons with the Jaguars, averaging 4.0 yards per carry, posting a catch rate of 73.4 percent (171 receptions on 233 targets) and scoring 12 combined touchdowns in 51 games. New England's backfield is fairly set with Sony Michel in a two-down and goal-line role, James White serving as the clear top pass-catching back, and Rex Burkhead in reserve. That said, Yeldon's skill set would be a boon to that corps, if he signs. Yeldon, an unrestricted free agent, remains unsigned as of Tuesday morning, Eliott Shorr-Parks of 94 WIP Sports Radio reports. Analysis: Recent history suggests the market is unkind to third- and fourth-tier running backs, but Yeldon should have some value thanks to his ability to handle passing downs. The 2015 second-round pick averaged 3.4 receptions per game in four seasons with the Jaguars, while his 465 carries yielded just six touchdowns and an average of 4.0 yards. There are a number of teams that could still use a passing-down back, including the Eagles, Ravens and Packers. Jaguars VP Tom Coughlin said he was "disappointed" in Yeldon and Leonard Fournette's (ankle) behavior during Sunday's loss to the Texans, Michael DiRocco of ESPN.com reports. Yeldon and Dave Williams could split the work out of the Jaguars backfield Sunday in Houston with Leonard Fournette (foot/ankle) doubtful and Carlos Hyde (knee) questionable for the game, John Oehser of the team's official site reports. Analysis: At the end of a lost season, Jacksonville may opt for a cautious approach with its veteran RBs. If both Fournette (as expected) and Hyde are among the team's inactives, Yeldon and Williams would be the remaining options at running back. In 14 games before being inactive Week 16, Yeldon averaged 4.0 YPC, reeled in 55 of 78 passes, and scored five touchdowns. Yeldon is inactive for Sunday's game against the Dolphins. Analysis: With Yeldon a healthy scratch, the Jaguars' Week 16 backfield with be comprised of Leonard Fournette, David Williams and Carlos Hyde. Yeldon rushed three times for six yards and caught one of three targets for five yards in Sunday's loss to the Redskins. Analysis: The Jaguars offense has managed to get even worse with Cody Kessler under center as they totaled 192 yards of offense Sunday, including a paltry 20 net passing yards. Yeldon had a quality first half of the season as Leonard Fournette was sidelined -- 680 yards from scrimmage and five total touchdowns -- but has produced little the last six games as Jacksonville's offense has completely fallen apart. Yeldon rushed once for seven yards and caught his only target for 10 yards in Thursday's loss at Tennessee. Yeldon rushed eight times for 16 yards and caught seven of eight targets for 49 yards in Sunday's 6-0 win over the Colts. Analysis: New quarterback Cody Kessler checked the ball down a lot, so Yeldon ended up leading the team in catches, targets and receiving yards. With Leonard Fournette serving a one-game suspension, Yeldon split backfield duties with Carlos Hyde, who had 13 carries and one catch. Fournette will return and head the Jacksonville backfield against the Titans in Week 14, but Yeldon's receiving skills should keep him involved in the upcoming Thursday clash. Yeldon should see an increased workload Sunday against the Colts after fellow running back Leonard Fournette was handed a one-game suspension, Adam Schefter of ESPN reports. Yeldon ran for 16 yards on three carries and caught two passes for 17 yards during Sunday's 24-21 loss to Buffalo. Yeldon rushed for 23 yards on five carries and added two catches for nine yards on three targets in Sunday's 20-16 loss to the Steelers. Analysis: Yeldon was out-touched by both Carlos Hyde and Leonard Fournette, with the former getting eight carries and the latter 28 carries along with two receptions. While Yeldon's receiving chops should keep him relevant when game flow calls for a pass-heavy approach, a healthy Fournette should see the vast majority of touches against the Bills in Week 12 and beyond, leaving few opportunities for Yeldon out of the backfield. Yeldon carried three times for 12 yards and caught five passes for an additional 56 yards during Sunday's 29-26 loss to the Colts. Analysis: Leonard Fournette's return to the lineup dramatically limited Yeldon's carries, but his involvement as a receiver allowed him to reach a respectable total of 63 scrimmage yards on the day. Fournette racked up 29 touches despite missing the last several weeks, so he appears to be past his latest injury issues for the time being. As such, Yeldon should be expected to take on a similar role next Sunday against the Steelers. Yeldon rushed twice for seven yards and added seven catches for 83 yards on nine targets in Sunday's 24-18 loss to the Eagles in London. Analysis: Yeldon got two carries to Carlos Hyde's six, but he was able to shine as a receiver with the Jaguars abandoning the run in the second half. The running back led the team in targets, catches and yards with Blake Bortles checking the ball down often. Yeldon's value after Jacksonville's Week 9 bye will primarily come from his pass-catching ability. Yeldon will serve as Jacksonville's starting running back Sunday against the Eagles in London, John Oehser of the Jaguars' official site reports. Yeldon rushed 12 times for 28 yards and caught five of seven targets for 40 yards and a touchdown in Sunday's 20-7 loss to the Texans. Yeldon is slated to head the Jaguars' Week 7 backfield, with both Leonard Fournette (hamstring) and Carlos Hyde (coach's decision) inactive for Sunday's game against the Texans. Analysis: Jamaal Charles is on hand to work in a complementary role Sunday, but Yeldon should see a full workload in Week 7. With Fournette also on track to miss next weekend's game against the Eagles, Yeldon will continue to fill in for the team's top back. However, by that time, newcomer Carlos Hyde should be familiar enough with the Jacksonville playbook to carve out his own role in the team's offense. Yeldon could yield backfield snaps to Carlos Hyde in the weeks to come after the Jaguars acquired the latter from the Browns on Friday, Michael DiRocco of ESPN.com reports. Yeldon (foot/ankle) doesn't carry an injury designation into Sunday's game against the Texans. Analysis: With Leonard Fournette (hamstring) ruled out for another contest, Yeldon will once again head the Jaguars' backfield in Week 7, with Jamaal Charles on hand to work in a complementary role. He'll take aim at a Houston defense that has allowed an average of 95.8	yards per game on the ground to date. Yeldon logged just eight carries in a 40-7 loss to the Cowboys in Week 6, but he should see more opportunities Sunday if game flow is more favorable. Yeldon (foot/ankle) returned to a limited practice Thursday. Analysis: Wednesday's absence thus appears to have been maintenance-related. With Leonard Fournette (hamstring) trending toward missing another game, it looks like Yeldon will once again head the Jacksonville backfield in Week 7, with Jamaal Charles on hand to work in a complementary role. Yeldon (foot/ankle) is expected to participate in Thursday's practice. Yeldon isn't in line to practice Wednesday due to foot and ankle injuries. Yeldon carried eight times for 41 yards and caught three of five targets for an additional 29 yards during Sunday's 40-7 loss to the Cowboys. Yeldon is expected to make another start at running back Sunday at Dallas, Phillip Heilman of The Florida Times-Union reports. Yeldon caught eight of 10 targets for 69 yards and a touchdown during Sunday's 30-14 loss to Kansas City. He added 53 yards on 10 carries. Yeldon (ankle) doesn't carry an injury designation into Sunday's game against the Chiefs after practicing fully Friday. Analysis: With his health not much of a concern at this juncture, Yeldon is slated to lead the Jaguars' backfield in Week 5 with Leonard Fournette (hamstring) already ruled out. Corey Grant is on hand to work in a change-of-pace role, but Yeldon is in line to do the heavy lifting against a Kansas City defense that has allowed an average of 123.2 rushing yards per game through four outings. Only four teams have yielded more yards on the ground this season. Yeldon (ankle) was limited at practice Wednesday. Analysis: Yeldon continues to manage an ankle issue that first surfaced after the Jaguars' Week 2 win over the Patriots, but it has yet to cost him any game action. It's thus expected that he'll be ready to go Sunday in Kansas City, where he's expected to lead the Jacksonville backfield with coach Doug Marrone already having ruled Leonard Fournette (hamstring) out for the contest. Yeldon and Corey Grant will share the backfield work for the Jaguars with Leonard Fournette (hamstring) ruled out for Sunday's game in Kansas City, Michael DiRocco of ESPN.com reports. Yeldon rushed 18 times for 52 yards and a touchdown while catching all three of his targets for 48 yards and a touchdown in Sunday's 31-12 win over the Jets. He also lost a fumble. Analysis: Yeldon has now scored touchdowns in both games featuring Leonard Fournette this season, but he was held out of the end zone in both of his starting stints when Fournette was out. His first trip to the end zone came courtesy of a 31-yard catch in the second quarter, and he added a one-yard rushing score in the game's final minute. Fournette's hamstring injury flared up and forced him out of this one, so Yeldon could regain the starting role in Week 5 against a generous Chiefs defense. Yeldon (ankle) practiced fully Friday and does not carry an injury designation for Sunday's game against the Jets, John Oehser of the Jaguars' official site reports. Analysis: Yeldon's Week 4 fantasy utility hinges on the status of top back Leonard Fournette (hamstring), who is trending toward being a game-time decision for this weekend's contest. 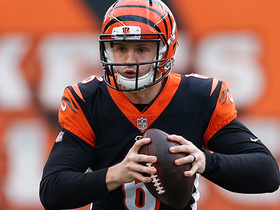 Fortunately for those considering either back in their fantasy lineups, the Jaguars kick off at 1:00 PM ET on Sunday. Yeldon (ankle) took part in Friday's practice but did not do any cutting drills, according to Michael DiRocco of ESPN.com. Analysis: Yeldon's practice schedule this week mimicked last week's plan, so it seems likely he will be available for Week 4 just like he was last Sunday. The only difference this time around is that fellow running back Leonard Fournette (hamstring) seems more likely to take the field than he did Week 3. While chances are Yeldon suits up Sunday against the Jets, his role would certainly be affected if Fournette returns after missing the last two games. Yeldon (ankle) returned to a limited practice Thursday. Analysis: Yeldon, who has been working through his ankle issue while filling in for Leonard Fournette (hamstring), figures to be okay for Sunday's game against the Jets. However, with Fournette now trending toward a return to action this weekend, Yeldon appears on track to reprise his normal complementary role in Week 4. Yeldon (ankle) is expected to practice Thursday, Tad Dickman of Jaguars PR reports. Analysis: It won't be clear until after practice how much Yeldon was able to do, but it's a good sign that he will likely get some work in after not participating at all Wednesday. Yeldon (ankle) didn't participate in practice Wednesday, John Oehser of the Jaguars' official site reports. Analysis: Yeldon has been working through the ankle issue while filling in for Leonard Fournette (hamstring) the past two weeks. With Fournette now trending toward a return to action Sunday against the Jets, Yeldon will likely return to his normal complementary role in Week 4, provided his ankle issue doesn't keep him sidelined. Yeldon (ankle) isn't expected to practice Wednesday, John Oehser of the Jaguars' official site reports. 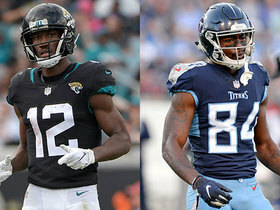 Coach Doug Marrone said Monday that he considers both Yeldon (ankle) and Leonard Fournette (hamstring) to be day-to-day, Michael DiRocco of ESPN.com reports. 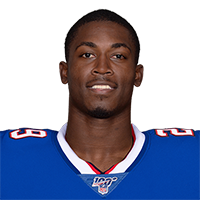 Analysis: It's interesting to hear Marrone mention Yeldon after he gained 44 yards on seven carries and 46 yards on six catches in Sunday's 9-6 loss to the Titans. While there wasn't any clear sign of a setback, Yeldon is likely dealing with some soreness after playing through a minor ankle injury and replacing Fournette in the starting lineup. The Jaguars hope to have their entire backfield available when they host the Jets in Week 4. Yeldon rushed seven times for 44 yards and caught six of seven targets for 46 yards in Sunday's 9-6 loss to the Titans. 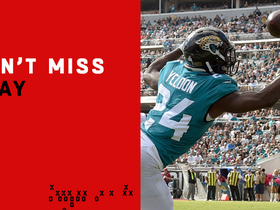 Analysis: Yeldon was Jacksonville's leading rusher and receiver, but that's more of an indictment on the rest of the offense than a compliment to him. He ceded a surprising amount of work to Corey Grant with Leonard Fournette (hamstring) out again, as Grant rushed six times for 11 yards. Given how poorly everyone else played, it's fair to wonder why Yeldon didn't get the ball more. He'll start at running back again next week if Fournette can't go with the Jets in town. Yeldon (ankle) is listed as active and starting Sunday's game against the Titans, John Oehser of the Jaguars' official site reports. Analysis: Meanwhile, Leonard Fournette, (hamstring ) is inactive. As long as his ankle holds up, look for Yeldon (10 carries for 58 yards and two catches for 13 yards in Week 2) to head the Jaguars' rushing attack in Week 3, but he figures to yield a share of touches to Corey Grant, who ran four times for 13 yards and caught six passes for 56 yards last Sunday against the Patriots. Yeldon (ankle) is expected to serve as the Jaguars' starting running back Sunday against the Titans, league sources tell Adam Schefter of ESPN. Yeldon (ankle) is questionable for Sunday's game against the Titans, John Oehser of the Jaguars' official site reports. Analysis: As is Leonard Fournette (hamstring), but fortunately for those considering either Jacksonville back in Week 3 fantasy lineups, the Jaguars kick off at 1:00 PM ET on Sunday. According to Michael DiRocco of ESPN.com, Yeldon (ankle) suited up for Friday's practice but "did not do any drill that involved cutting." Analysis: DiRocco noted that Yeldon's ankle was not wrapped, so it's unclear if he was withheld from cutting because he is still sore, or if the coaching staff was just being cautious. One way or another, more should be known about Yeldon's status when the Jaguars reveal their Week 3 injury report around noon ET. Yeldon (ankle) returned to a limited practice Thursday, Jim Wyatt of the Titans' official site reports. Analysis: We'd expect Yeldon to be able to play Sunday against the Titans, though his fantasy ceiling in Week 3 hinges on the availability of Leonard Fournette (hamstring), who has logged back-to-back limited practice sessions. Yeldon (ankle) is expected to participate in Thursday's practice. Yeldon (ankle) didn't practice Wednesday, Phillip Heilman of The Florida Times-Union reports. Analysis: Meanwhile, starting running back Leonard Fournette (hamstring) practiced in a limited fashion Wednesday and reportedly looked good doing so. Assuming Fournette is available Sunday against the Titans, Yeldon's Week 3 fantasy value will take a major hit even if he shakes off the ankle injury. Yeldon isn't expected to practice Wednesday due to an ankle injury. Yeldon rushed 10 times for 58 yards and caught two of five targets for 13 yards in Sunday's 31-20 win over New England. Yeldon is in line for added work Sunday against the Patriots, with Leonard Fournette (hamstring) inactive for the contest. Analysis: With Fournette out, Yeldon is in line to lead the Jaguars' Week 2 ground game, with Corey Grant on hand to spell him, along with Brandon Wilds. Yeldon is thus worthy of a Week 2 lineup slot in most formats. Yeldon's teammate, Leonard Fournette (hamstring), appears unlikely to play Sunday against the Patriots, ESPN's Adam Schefter reports. Analysis: A final call on Fournette's Week 2 status has yet to be made, but it would seem pretty risky for the Jaguars to roll with him Sunday after he missed practice all week. If he is scratched from the team's 4:25 ET kickoff, Yeldon profiles as a nice lineup plug-in this week. Yeldon's role for Week 2 against New England remains uncertain with teammate Leonard Fournette (hamstring) considered a game-time decision, Mike Kaye of First Coast News reports. Yeldon rushed 14 times for 51 yards and caught three of seven targets for 18 yards and a touchdown in Sunday's season-opening 20-15 win over the Giants. Analysis: Yeldon took over starting duties after Leonard Fournette left with a hamstring injury. The veteran made an immediate impact, capping a second-quarter touchdown drive with a one-yard reception after ripping off a 15-yard run on the previous play. Given his usage here, Yeldon will be a must-add in both standard and PPR formats should Fournette's injury keep him out for any extended period. Yeldon took 10 carries for 39 yards and caught five of six targets for 73 yards in Saturday's preseason game against the Vikings. Corey Grant likely will push Yeldon for backup work, Mike Kaye of First Coast News reports. Yeldon (illness) is not listed on the Jaguars' injury report in advance of Sunday's playoff game against the Steelers. Analysis: Yeldon, who missed the team's wild-card win over the Bills this past weekend, is healthy enough to suit up Sunday. If he does, he'd re-enter the backup mix behind Leonard Fournette, who logged 21 carries for 57 yards and caught three passes for 21 yards against Buffalo. With Fournette clearly the team's lead back, Yeldon's fantasy utility is restricted to deeper PPR formats these days. Yeldon (illness) is inactive for Sunday's playoff game against the Bills. Analysis: With Yeldon unable to rally in time for the contest, Chris Ivory is in line to serve as Leonard Fournette's top backup Sunday, with Corey Grant also on hand. Yeldon (illness) is listed as questionable for Sunday's playoff game against the Bills, Ryan O'Halloran of The Florida Times-Union reports. Analysis: We'd expect Yeldon to recover in time to suit up for Sunday's contest, and assuming that's the case, he'll continue to work behind starting RB Leonard Fournette. It's an arrangement that limits Yeldon's fantasy utility to deeper PPR formats, as long as Fournette is available. Yeldon was not spotted at Friday's practice after sitting out Thursday with an illness, according to Tom Pelissero of NFL.com. Analysis: It's not clear just how under the weather Yeldon is, but he is apparently feeling ill enough to sit out back-to-back days of practice leading up to the Jaguars' wild-card game this weekend. His official status for Sunday's matchup with the Bills will be revealed after Friday's practice comes to a close. Yeldon carried seven times for 27 yards and caught four of five targets for an additional 25 yards in Sunday's 45-7 win over the Texans. Analysis: In the absence of Leonard Fournette, Yeldon equaled his second-highest number of touches in a game this season. He mustered just 3.9 yards per carry, but he did tie for second on the team in targets and catches. Yeldon wasn't particularly impressive with Fournette out of commission, so any fantasy stock he carried would likely elude him if the team's lead back returns next week against the 49ers. Yeldon is in line for an increased workload Sunday against the Texans due to the likely absence of Leonard Fournette (quadriceps), Michael DiRocco of ESPN.com reports. Yeldon ran for nine yards on two carries during Sunday's 30-24 win over Seattle. Analysis: Yeldon entered Sunday as a potential pass-catching threat with multiple grabs in five of his last six games. That fell apart on Sunday, and the former second-round pick saw the field for only four offensive snaps. He and Chris Ivory have juggled the No. 2 job in recent weeks, with Ivory in the current lead. It probably doesn't matter, however, with Leonard Fournette topping 20 touches in three of the last five games. Yeldon had three carries for 10 yard and caught five of six targets for 42 yards in Sunday's 27-24 loss to the Cardinals. Analysis: With Leonard Fournette unable to get going and the Jags playing from behind for nearly all of the game, Yeldon picked up some extra snaps and touches, while Chris Ivory lost a fumble on his only carry. Yeldon's role as the passing-down back could lead to some productive outings when the Jags are forced into catch-up mode, but a Week 13 home matchup against the Colts is far from ideal for that scenario. Yeldon ran for 15 yards on five carries and added a five-yard catch during Sunday's 19-7 win over Cleveland. He fumbled once during the contest. Yeldon rushed three times for 11 yards and caught six of eight targets for 39 more in Sunday's 20-17 overtime win against the Chargers. Analysis: Yeldon didn't get much work on the ground with Leonard Fournette back in action, but Fournette didn't exactly light the world on fire with 33 rushing yards on 17 carries. The 2015 second-rounder's receiving ability earned him plenty of second-half playing time with his team trailing most of the way, as Yeldon set a season high in catches with six. Yeldon should continue to play in passing situations, but his value will be limited while Fournette's healthy and active. Yeldon rushed for 41 yards on 11 carries and added another 11 yards on two catches in Sunday's 23-7 win over Cincinnati. He lost a fumble during the contest. Yeldon is active for Sunday's game against the Bengals, according to John Oehser of the Jaguars' official site. Per Adam Schefter of ESPN, Chris Ivory will start at running back with Leonard Fournette (coach's decision) inactive, but Yeldon could have a prominent role in the game plan. Jaguars head coach Doug Marrone said Yeldon will be active for Sunday's game against the Bengals, John Oehser of the Jaguars' official website reports. NFL Network's Marcas Grant and Michael Fabiano project fantasy stats from key players in the "Thursday Night Football" matchup between the Jacksonville Jaguars and Tennessee Titans in Week 14. 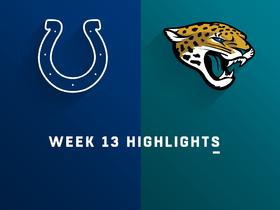 Watch the highlights as the Indianapolis Colts take on the Jacksonville Jaguars in Week 13. 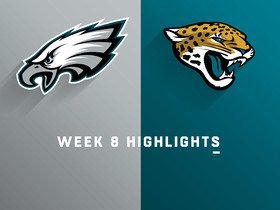 Watch highlights from the Philadelphia Eagles Week 8 win vs. the Jacksonville Jaguars in London. Jacksonville Jaguars running back T.J. Yeldon brings down a spectacular catch for a 37-yard gain vs. Philadelphia Eagles. Jacksonville Jaguars quarterback Cody Kessler finds running back T.J. Yeldon in the end zone. The play was ruled illegal forward pass but after a Jaguars challenge the call is overturned for a confirmed touchdown. 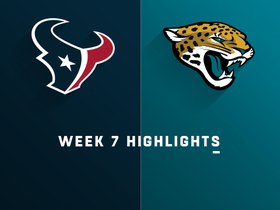 Watch the best plays from the Week 7 matchup between the Houston Texans and Jacksonville Jaguars. 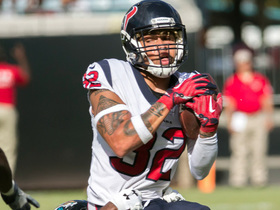 Houston Texans safety Tyrann Mathieu picks Jacksonville Jaguars quarterback Cody Kessler on tipped pass intended for running back T.J. Yeldon. 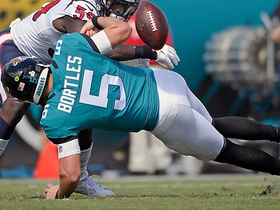 Jacksonville Jaguars quarterback Blake Bortles fumbles and Houston Texans safety Kareem Jackson recovers for the Houston Texans.